What? | Unable to play out from the back effectively to combine with midfielders when #3 and #4 have possession. When? | When #3 & #4 have possession. Why? | #6 not sitting high limits space in front of #3/4; but #3/4 fail to spot opportunities to drive play forward & combine with midfielders. Football Problem | when playing out from the back, we struggle to get #3/4 into midfield in controlled possession, facing forward in a position to combine with midfielders. Past: quite wasteful in possession in our back third when trying to play out. The opposition front line to sat deep during goal-kicks and our #3/4, in particular, failed to recognise the opportunities to drive play forward into midfield. We saw our #6 drop back to provide passing options where we didn&apos;t need him and this made it difficult to build up play through the middle. Present: Tonight, we&apos;re going to address this issue by (i) creating space for our central defenders to drive forward, and (ii) helping them to make better decisions about when and where to do that. Future: Next week we&apos;re playing Germany - who love a high press, so, if we can fix this issue tonight not only will we create more space for our #3/4 but we&apos;ll also make better decisions about how to exploit that space and overload the midfield. Session Objective: to improve my teams ability to effectively play out from the back through central players; and to get #3/4 into midfield, in possession, facing forward to combine with the midfield three. 16 players in total; 2 groups of 8. Each group sets up as shown above, either #1-3-2-6-8 / #1-4-5-6-10. In either group, play will always start from the #1 playing to #3/4. After which, play will be dictated, largely by the players decisions. Throughout each variation, the objective remains the same; get the ball to #8/10 from #3/4 by combining through #6 and #2/5. A. no defender - #3/4 receives a pass from #1 and drives forward with their first touch; #6 shows short for the ball, #2/5 moves high or vice versa; whatever happens #6 and #2/5 must combine before the ball is played to #8/10. #8/10 receives facing forward before dribbling back to #1 to restart. B. one passive defender - as above, except now the passive defender must press #3/4 and block the pass to either #6 or #2/5. Again, #6 and #2/5 must combine before playing to #8/10. C. two passive defenders (flat) - as above, except now, p.defenders can mark #6 and #2/5 allowing #3/4 to dribble through a play to #10 OR one p.defender presses/directs #3/4 and blocks pass to #6 or #2/5. D. two passive defenders (cover) - as above except, one p/defender presses #3/4 whilst the other presses #6 or #2/5 when they receive. 16 players total: 2 groups of 8 players. Each group sets up as shown above. A supply of footballs are placed at the corner of each area, nearest to #3/4 so that play may be restarted quickly. Play always restarts from the #3/4 dribbling or passing into the area from their end line. 5v3 where the intention is to play from #3/4 to #10. Yellow score by playing a pass to #10. Red score by dribbling to the any edge of the area. Rotate red defender after 1/2 minutes. 1. Yellow score by playing a bounce pass with #10. Get #3/4 into midfield in controlled possession, facing forward in a position to combine with midfielders. 1. #1 try to pass to #3/4 when they have space in front of them to receive & move into. 2. #2/5 try to get into a position that will create space for our #3/4 to receive facing forward. 3. #2/5 try to provide passing options for #3/4 when they&apos;re under pressure. 4. #3/4 try to drive forward with the ball into midfield until there&apos;s pressure from an opposition player. 5. #3/4 try to get into a position that allows your to receive the ball with space in front of you. 6. #3/4 try to get into a position that supports #6/8/10 in possession in midfield. 7. #6 try to set up in a high position that creates space in front of #3/4 but doesn&apos;t crush space for #8/10. 8. #8/10try to get into a position where you can receive between lines facing forward. 1. #1, when playing out to #3/4 can you pass in such a way that they&apos;re able to their first touch beyond the opposition front line? 2. If the opposition winger is sitting pretty central, can you get them to follow you into a wider position to create space for our #3/4 to receive? 3. If the opposition winger doesn&apos;t budge, can you show for the ball and receive facing forward? 4. #3/4 if the opposition #9 is sitting high, can you set up in positions that make it impossible for him to mark both of you at the same time? 5. #3/4 if an opposition player presses you, can you pass to a team mate with space in front of them? 6. #3/4 if you can&apos;t see a team mate with space in front of them, can you play to a team mate who has lost their marker? 7. 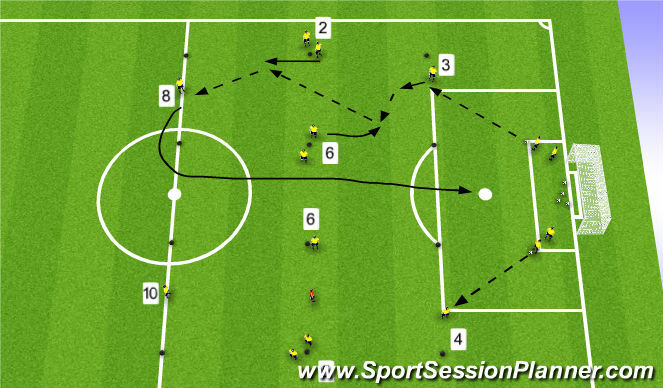 #6, if #3/4 have possession with space ahead of them, stay high and look to offer a passing option in midfield. 8. #6, if 3/4 have possession but are being pressed, can you spot the danger and drop to offer support? 9. #8/10, when #3/4 have possession try to set up on different lines? 10. #8/10, when #3/4 have possession, can we be aware of where #6 is and move to provide support on either side? 16 players total; BP#1,3,4,2,5,6,8,10 vs BPO#9,7,11. A supply of footballs is placed in one large goal so that play may be restarted quickly. Play from throw-ins in back third - all other out of bounds will restart with BP#1. 9v7 where the intention is to play out through #3/4 into the middle third & hit #9/7/11 third. Yellow score by passing to #9 or #7/11 (represented by goals) but can only do so in the middle third (orange cones). Red score by finishing in the large goal. Rotate #9 after each goal. To get #3/4 into midfield in controlled possession, facing forward in a position to combine with midfielders #6/8/10. 2. #1/2/5 try to get into a position that will create space for our #3/4 to receive facing forward. 8. #8/10 try to get into a position where you can receive between lines facing forward. 16 players total; BP#1,3,4,2,5,6,8,10 vs BPO#9,7,11. A supply of footballs is placed in one large goal so that play may be restarted quickly. Play throw-ins, but, all other &apos;out of bounds&apos; must restart with BP#1 playing out. 8v8 where the intention is for players to play freely and competitively whilst we observe whether learning / improvement has occurred in relation to our session objective. > BP score by playing through the gates which represents BP#7/9/11 - if BPO#4 intercepts - no goal - play on! > BPO score in the large goal. 1. Did the session achieve its objective? 2. Is there observable improvement in performance of the team task? 3. Are players executing player tasks independently?